Will Aoléon, Gilbert, Bizwat, Helios, and Zoot be able to rescue Aoléon’s parents and stop the Martian invasion of Earth in time? My Review: I really enjoyed this 4th installment. This is where the action really picks up and engages the reader. 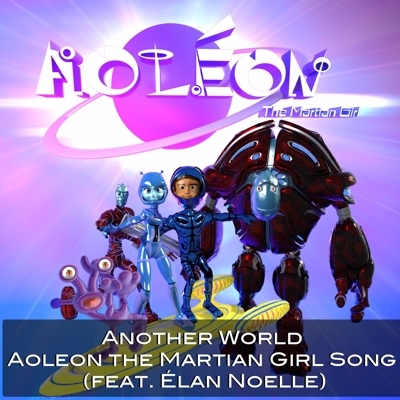 Aoleon and Gilbert learn that the Martians really do plan to invade Earth and are determined to stop it from happening. A few Martians make it to the planet and what happens is really funny. I think younger readers will really love the mental pictures these words create. The story goes back and forth between Mars and Earth for a little bit and it was a lot of fun to see what was going on. Speaking of pictures, once again, the graphics are amazing--you can tell just by the cover. I love the way there are pictures interspersed with the story. That little purple guy pictured in the album cover is a pet (Zoot) and the close up of him is incredible. You can literally see each little piece of his fur. The characters and places are done in brilliant colors that really catch the eye. Back to the story...Aoleon and Gilbert are like dear friends now and I couldn't help but cheer them on in their quest. They encounter some crazy, perilous adventures, along with their friend Bizwat and his friend Helios. I enjoyed getting to know Bizwat better and he surprised me. There's more to him than just being a pizza delivery guy. 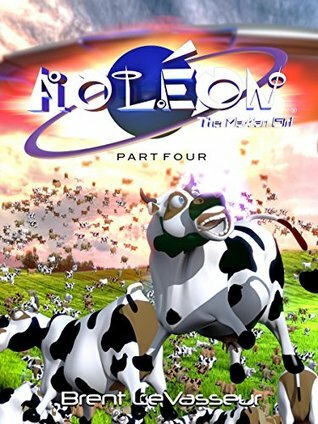 There are some theories on different things introduced in Part 4, such as, what really happened to dinosaurs and what happened in Roswell, that I found to be very creative. I think the things I enjoy most about this series are the facts that it really causes a reader to think, question ideas, and spurs creativity. As I've mentioned before, these engaging pictures, fun characters, and an adventurous storyline will really draw kids in. Content: two uses of mild language; moments of peril.